I'm going to be honest, These veggie burgers have a couple things going against them. They aren't the prettiest vegetarian burger on the block and they have two ingredients people tend to dislike, blue cheese and beets, as featured ingredients. So am I just crazy? Did the lack of sleep from the baby finally get to me? No, no, no. Guys, listen to me, they are so delicious. 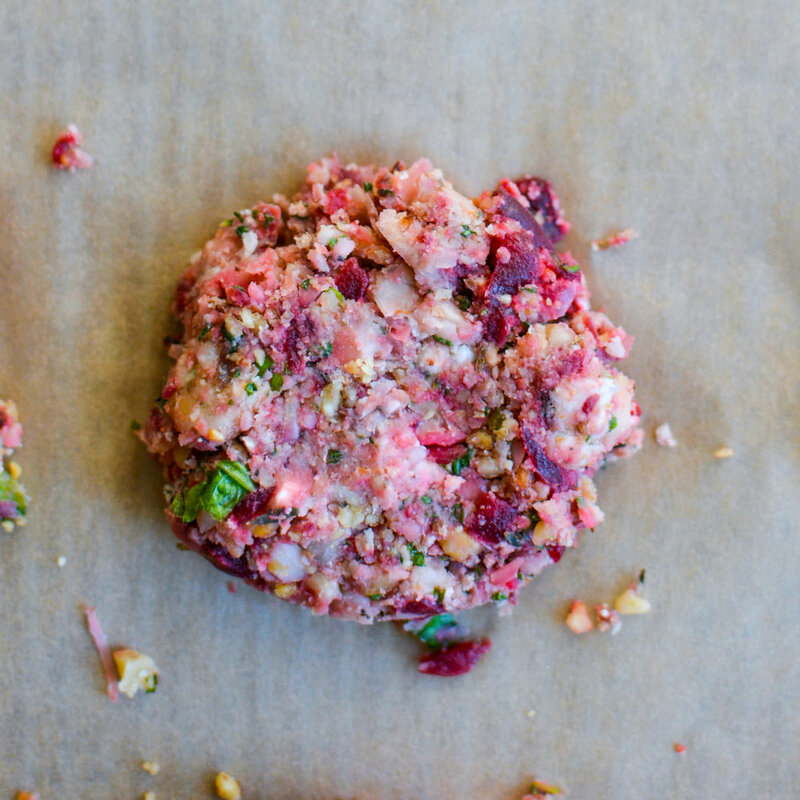 Blue cheese, beets and walnuts are a match made in meat alternative burger patty heaven. The sweetness of the beets pairs perfectly with the tangy blue cheese and nuttiness of the toasted walnuts. Lemon-pepper arugula is not just a garnish, it adds a fresh crunch at the end of each bite. The small size of the patties makes them perfect for an appetizer or to turn a regular weekday night into a fun eating occasion. The key to success with this recipe is not to over-process the ingredients. If the ingredients are over-processed it will result in the "refried beans" effect leaving your burger with the texture of, you guessed it, refried beans. Not the desired outcome. The beets, kale and beans should be pulsed in the food processor so that there are small, individual bits of all the ingredients visible. I included a picture of the uncooked patty to show the texture. A 1/2 cup of beans are left out of the food processor for extra texture (read: extra protection against the refried beans effect). Note: This recipe may look familiar to all my longtime blog readers! I made a similar bean and beet burger in my early blog days. I decided to remake them for my Meatless Monday series on Patch. I ended up altering the recipe quite a bit so decided to share the new recipe with you guys.